I'm big on takeout, especially Chinese food. It's a family favorite. After a long day of running around, sometimes it's just easier ordering takeout vs figuring out a quick meal my family will enjoy. The only downfall in ordering out is waiting. Have you ever ordered takeout and the wait is well over an hour? On top of waiting you have a hungry toddler and cranky seven year old? Take it from me, it's not pretty! That's when Blue Dragon comes in. Blue Dragon inspires families to prepare new and flavorful meals at home. In less time than it takes for delivery to arrive, you can instead create delicious, authentic-tasting Asian meals at home! 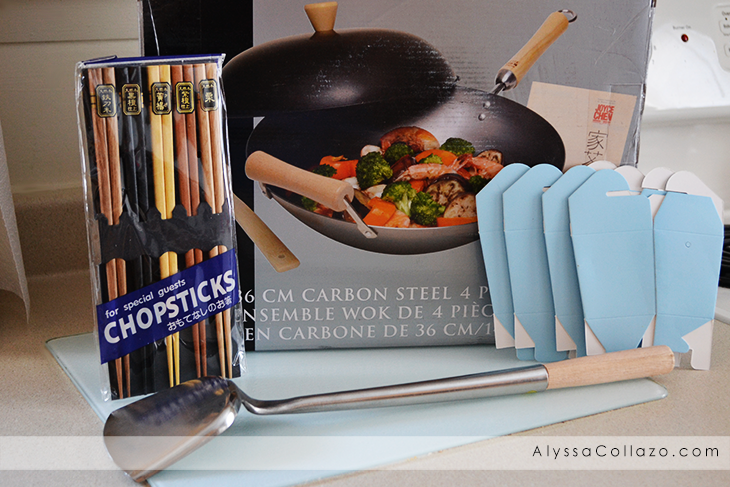 I received a box FULL of Blue Dragon products plus a Wok Set, Takeout Containers, Chopsticks, and a Wok Spatula. Honestly, I was both surprised and overwhelmed by how much variety there was and deciding what I would make. Everything looked so GOOD. I went with something I've been dying to try Chow Mein. I was a little nervous making Chow Mein because well I've never ever used a Wok. 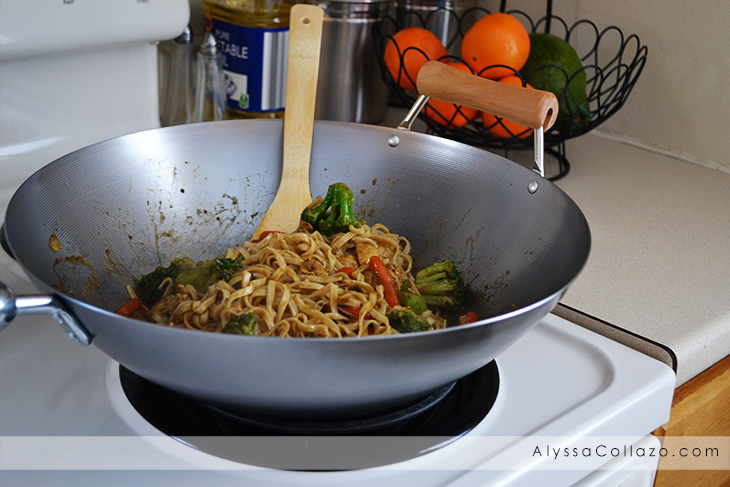 Thankfully I was nervous for absolutely no reason because it was so fun to use a Wok and making Chow Mein. This recipe took about 25 minutes to make including prep time. And the best part, I didn't have to get my kids dressed just to pick up takeout. I was able to spend more time with them and make a delicious and EASY authentic meal they loved. 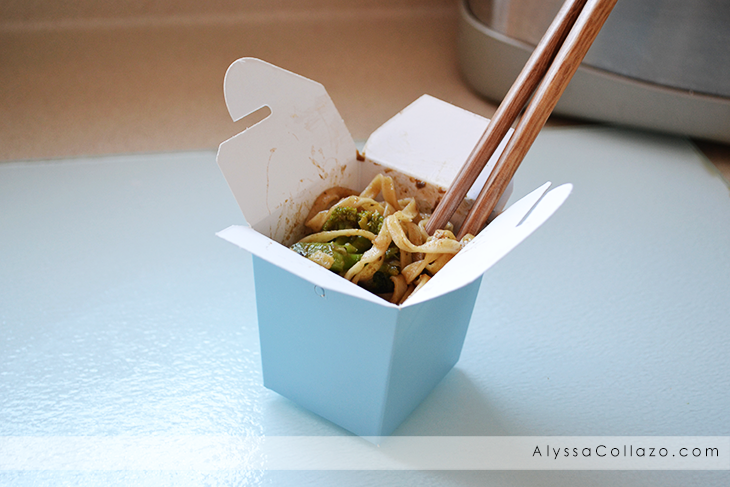 The Takeout Containers and Chopsticks were the perfect touch to make our meal feel like Homemade Takeout. 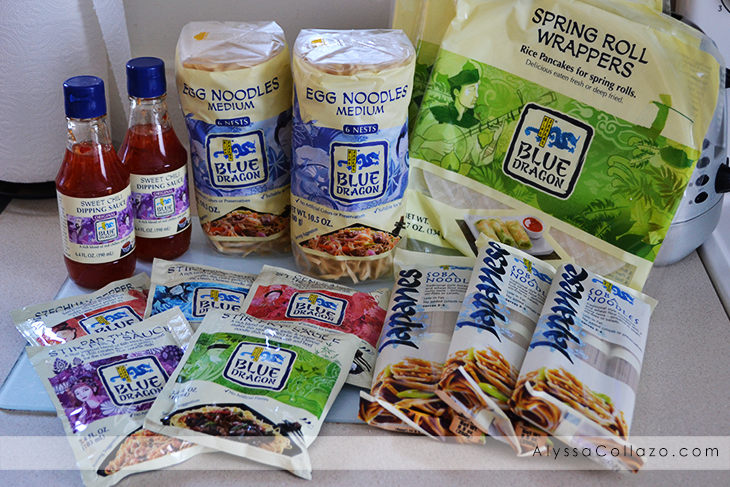 We are looking forward to trying the rest of the products Blue Dragon sent us. Blue Dragon Sauces are available in several different flavors including Broccoli Beef, Phad Thai, Szechuan Pepper, Chow Mein and General Tao. I can't wait to try General Tao and Spring Rolls. Here is the recipe for Blue Dragons Chicken Chow Mein. Heat the vegetable oil in a large wok and stir fry the peppers, mushrooms, and broccoli over a high heat for 1-2 minutes. Add the chicken. Cook until the meat is sealed and browned. Add the sauce and simmer for 10 minutes, stirring occasionally. Stir through the cooked Egg Noodles and serve immediately. Recipe courtesy of Blue Dragon. Full recipe here. This recipe can be switched up with different veggies or proteins, so make it a weekly staple with variations to keep things interesting. Blue Dragon Sauces are delicious, and now you can try them first hand. My local readers can visit Hannaford in Marlborough MA to try a sampling of Blue Dragons incredible sauces. Now it's your turn to try Blue Dragon! Influence Central is giving ONE of my lucky followers the chance to win samples of Blue Dragon sauces and a cooking kit including a wok, spatula, chopsticks and take out containers. One (1) winner will receive: A Blue Dragon Prize Pack including: Samples of Blue Dragon sauces and a cooking kit including a wok, spatula, chopsticks and take out containers. Contest entrants are only eligible to win once per sweepstake, per household as part of a campaign sponsored by Influence Central. Ends 2.19.15. Be sure to follow Blue Dragon on Facebook and Subscribe to Blue Dragons Youtube Channel. That sounds absolutely delicious. I have never heard of this brand, but I will be on the lookout for the next time I'm in the store. Sounds awesome. I would love to try the chicken chow mein. It looks delicious! I also love chow mein, so I be it would be amazing! Those broccoli and beef kebabs look really good, would love to try those. The chicken chow mein looks delicious! I love Chinese food, so I can't wait to give this a try. The dish you made looks and sounds so yummy! I am happy to say I entered and shall be back to continue to tweet. =) I love me some chinese food! =D hehe. Thank you for such a amazing giveaway! And to answer your question... Asian Chopped Salad with Red Curry Shrimp would be my choice!!! =P So yummy!!! Chicken Stir Fry Lettuce Wraps! This looks delicious!! I love making asian food but my kids aren't too keen on it...they wouldn't even eat a pad thai I made with peanut butter in it...really?! lol! It all looks yummy! The Pork Noodle Bowls with Aromatic Spiced Pork Fillet caught my eye as something that would be fun to try. That does look yummy and healthy (I couldn't have the noodles - so would just delete that part!) - and I can have it!! I would love to try the Chili coconut chicken. Yum! This sounds so delicious. I love the little carton box you served it in too, so sweet and perfect for a lovely dinner! I love that they have the takeout containers and chopsticks. I'd like to try the Broccoli Peppered Beef. The broccoli beef kebabs look great! Ohh this looks really yummy and drooling to give a bite, too! haha! Want to try this soon. oh we like Chicken Chow Main.. i never knew how to make this until now.. thanks for the share! Everything on blue Dragon's website looks delicious! But I had my eyes on the sweet chili quesadilla. Can't wait to try it! Thanks for the chance! I am trying the chicken chow mein recipe but I am going to substitute the vegetable oil with coconut oil, I will let you know how it comes out. I would loooooove to try the Asian chopped salad with red curry shrimp! That looks so good! I love the idea of making Chinese food at home. It's so yummy! Yum! This looks and sounds delicious. I've never made Chinese at home but what a much better bang for your buck! Great giveaway! I would like to try making the honey teriyaki beef and asparagus! Omg now this is my kinda meal!!! I love all foods Asian! This giveaway is great!!!! I am not big on Asian food, and have never heard of this brand, but this does look very good. I'll have to try it sometime. I looooove chicken chow mein, one of my favorite meals! It was one of my biggest cravings when I was pregnant, now my daughter loves it too. Great giveaway. That beef and cabbage recipe looks pretty tasty to me. Thank you for hosting the giveaway! I would love to make Broccoli Beef & Cabbage Stir Fry! It sounds delicious, but they all do honestly! Oh my goodness! What a great box full of stuff you got! I love making all kinds of Asian food at home, and we always use chopsticks to eat it with. So much fun! Yours looks delicious! I am a huge sucker for chow mein. It is so delicious, especially with pork. This looks great! I totally want to try this! Looks delicious! I would love to win it! Yum! We love Chinese food. This looks so awesome and fun. Thanks for the giveaway. Chow mein right now sounds ssooo good! I'll throw in some shrimps for good measure. This is an awesome giveaway especially for those who like preparing Asian dishes at home like us! :) We rarely order food for home delivery because mom loves cooking so much and she prefers to make our own Chinese food. This looks like a great Chow Mein recipe. My family loves Chinese food but i have never tried to make it myself. I will have to try this weekend. Oh wow, your Chinese food really looks like Chinese food. I have a wok and have not had too many successes with it. I'd like to try the Broccoli Beef Kebabs and Chilli Coconut Chicken Stir Fry from the website. This looks so amazing, I would love to try it! Thanks for sharing! I think the broccoli pepper beef looks pretty amazing. And all of their kabobs .. I haven't done kabobs in forever..
My husband would love this. He loves Asian inspired dishes and when he wants them I leave the cooking up to him. I would like to try the broccoli beef kebabs. I am always looking for new stir fry recipes! Hope I win! My hubby loves stir fry. We definitely need to get a wok for our house. Thanks for your recipe. Broccoli Beef and Bok Choy would be my first pick. This is such a great giveaway! I really need to get myself a wok if it makes it that easy to make good dishes! I'd love to the Vietnamese Salad with Chicken or the Quick Sweet and Sour Chicken! Oh I would love to try the Butternut Squash Stir Fry! That looks so good! This is perfect for the chinese new year! I love the blue chinese take-out box too! I would love to win this and see if my kids would like the Peas and Carrots Chicken Stirfry! I know I will! I'd love to try the Chicken Chow Mein with Crunchy Vegetables. It looks so good! Id like to try the Asian salad and the chow mien. It all looks so difficult to make but it would be fun to try. I'd like to try the recipe for Beef Chow Mein. It looks similar to something my mother used to make. I love stir fry. So anything of that sort. I would love the new wok and all these yummy treats. I would love to try the Honey Teriyaki Beef Stir Fry, thanks! I would love to try the Szechuan Shrimp Stir Fry.